So, today there are 3 phrases that all have related meanings. These are Levantine, but are probably used outside the region as well. Edit 10/24/2011: There were 40 entries into the drawing and the winner of the language software is bcbeaveratheart! I used a random number generator to pick the winner. I will be contacting them to give them their prize. 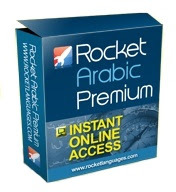 I was recently contacted by Rocket Languages and they want to do a free giveaway of their Arabic language software. I did a review of their program here and it will get you a great foundation in Egyptian Arabic. Egyptian dialect is a great choice since Egypt is the most populous Arabic country by a wide margin. It's also used widely in Arabic movies and TV shows and knowing Egyptian will make it easier to learn other dialects as well as MSA. Almost 5 years ago I began my journey to learn Arabic by studying MSA. If I had it to do over again I would have gone with a dialect, either Egyptian or Levantine. MSA is what you need to know if you plan to watch the news, or select TV shows (some cartoons and historical shows are done in MSA), but if you only know MSA and walk down the street in any Arabic speaking country, everything you hear around you is going to sound like gibberish. So, starting off with Egyptian is a good way to go. All you need to do to enter the drawing is make a comment to this post. Don't post as Anonymous. Choose a name. Include your email in the post so I have a way to contact you if you win. I won't approve the comment so that no one else can see your email address. The winner will be randomly chosen and announced on Sunday, October 23 and then he/she will have 5 days to email me back and claim the prize. So phrases are an important thing in any language. These phrases are used at least in the Levant region, but possibly in other Arabic speaking countries as well. However, everyone will understand what you are saying no matter which country they are from, even if they themselves would say it a little differently. 1. جيت و الله جابك (jeet wa allah jaabak) - You came in the nick of time. Literally this phrase means "you came and God brought you", meaning you got there right when you were needed. 2. جيت بوقتك (jeet ibwa'tak) - You came at the right time. Literally this says "you came at your time". It has pretty much the same meaning as جيت و الله جابك . This post consists of clips taken from Jamil wa Hanaa (جميل و هناء), a Syrian comedy. As I was watching this episode (episode 25, season 1) I made note of some words and phrases that are useful. They're all said at normal speaking speed and the show is intended for native Arabic speakers, so it may be difficult, but if you listen to each one several times you'll get it. This dialect is Syrian, but it's close enough to other Levantine dialects to be understood in many places. 1. نص ساعة دعايات ربع ساعة برامج. خلصونا بقى (nus sa'a di'ayaat rub'a sa'a baraamij. khalisoona ba'a) - Half an hour of commercials and a quarter hour of shows? Come on! The woman's name is ام محمود (Im Mahmud). She bought a lotto ticket and is watching the TV show to see if she won or not. She's annoyed because there are more commercials than actual show. نص is نصف in MSA and means "half"
2. العمى! حطيت 70 ليرة عالفاضي (al'ama! huttayt 70 lira 'al faadi) - Damn! I spent 70 lira for nothing. It turns out that ام محمود 's ticket didn't win in the first round so she is upset. عالفاضي - combination of على "on" and فاضي "empty". Literally the sentences says "I put 70 liras on nothing". عالفاضي is used to expressed wasting something or getting nothing in return. Im Mahmud? Im Mahmud? Yah! Where did she go? It's not normal for her to go outside the house and leave the apartment door open. And here's her cane. She can't walk without it. What's going on? On the last drawing Im Mahmud's ticket won so she had a mini stroke and her neighbors took her to the hospital. The lady in this clip is another neighbor wondering where she went. شو القصة - literally "what's the story? ", but means "what's going on?" Neighbor, may God be pleased with you. You stay here an hour or 2. If Im Mahmud dies, let us know. Why? Where are you guys going? We're going home. We're fed up. We've been here for a long time. The man is Jamil. He and Hanaa, his wife, brought Im Mahmud to the hospital and have been waiting there for a long time. He's tired and ready to leave. شي ساعة ساعتين - the word شي means "about" here. "About an hour or 2"
دق خلقنا - a saying that means "we're fed up"
Arabic Pod 101 is a subscription site that teaches Modern Standard Arabic with audio and video lessons. The site is geared toward an absolute beginner to intermediate level, so if you can watch TV shows or the news in Arabic and miss very little then this site isn't for you. This site is good for those starting out in Arabic. Their native speakers who read the words and sentences for you are Egyptian, so some of the things they say have an Egyptian flavor to them, but it is still definitely MSA not dialect. One thing I found very helpful about this site is the 2000 most common word list. It's not just a list of words, how they're spelled, and what they mean. They also have someone say the word and a few sentences to give you context on how the word is used. Seeing and hearing words used in context is the best way to learn a new language and I wish I had this list when I started learning Arabic. You can also have a word of the day sent to your email address. I've been doing that for a while and there have been a few I didn't know, like today's word ردهة الفندق (rudhat ulfunduq) - hotel lobby. I had never seen the word ردهة before. They have audio and context for the words of the day as well. They have a free 7 day trial going so you don't have to pay anything to see if Arabic Pod 101 is going to be useful for you. If you decide you like it they have 2 different subscription options. The Basic option is $4/month and the Premium option is $10/month. Both options give you access to all the lessons, but the Premium subscription gives you some extra perks like access to their vocabulary videos where they give you a picture of a thing or an action, have someone say the word, and have the word written. It's a good way to pick up vocabulary. The Premium option also gives you access to the list of the 2000 most common Arabic words that I mentioned. For their free trial, go here.